Morrissey: "Given that the Volt and Bolt are being marketed to eco-conscious buyers, entirely vegan options would only broaden their appeal." Singer Morrissey, as part of a new PETA campaign, has asked General Motors to offer vegan leather interiors for its Chevrolet Volt and Bolt models. In a letter to CEO Mary Barra, as the Detroit Metro Times reports, the former Smiths singer wrote, "A staggering 51 percent of global greenhouse-gas emissions are caused by animal agriculture. Animal skins also have to be treated with a toxic soup of chemicals in order to keep them from decomposing, and runoff from leather tanneries poisons vital waterways." The singer also cited a recent PETA investigation of the brutal conditions at Brazilian cattle ranches that supply leather to GM, Toyota and Volkswagen. "Given that the Volt and Bolt are being marketed to eco-conscious buyers, entirely vegan options would only broaden their appeal," wrote Morrissey. Tesla Motors currently uses vegan leather in its cars. 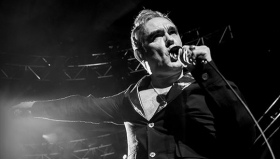 Morrissey's letter comes after animal rights organization PETA released a video last week detailing the treatment of cows at Brazilian cattle ranches linked to various automakers including GM, Volkswagen and Toyota. PETA has urged its members to pressure the automakers to replace leather interiors with a substitute so consumers "can easily make the compassionate choice for animals." GM spokesman Nick Richards said the company has "very specific guidelines for our suppliers that require them to follow all local laws and regulations," in addition to prohibiting animal abuse. "All the leather we use in our vehicles is a byproduct of some other use of the animal," Richards said. "So those animals are not raised specifically for their leather." Regarding PETA's request that GM offer a vegan leather option for Bolt and Volt interiors, Richards said most GM vehicles already have non-leather options. Meanwhile, Morrissey was scheduled to appear in a Detroit suburb Wednesday night, but the Detroit Free Press reported that the concert was rescheduled to Dec. 7 due to "a member of the Morrissey touring party's illness." This story originally appeared on Billboard.com and was made available by Bloomberg to its subscribers. John Irwin of Automotive News contributed to this report. As I head to Detroit to play the Royal Oak Music Theatre, I'm writing to ask GM to make Chevy's Volt and Bolt more eco-friendly by giving buyers the option to choose vegan leather interiors-including steering wheels and gear shifts. GM is named in PETA's brand-new investigation of cattle ranches, on which animals are branded on the face, electro-shocked, and beaten before they're slaughtered and used to make leather interiors for car companies, including yours.